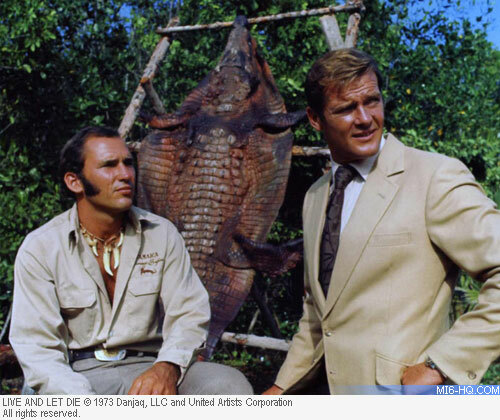 After Roger Moore debuted as 007 in the summer of 1973, The Washington Post flew to Jamaica to meet the eccentric crocodile wrangler, Ross Kananga. As well as performing one of the most impressive stunts of the film, Kananga lent his name to the San Monique diplomat and antagonist of "Live And Let Die". This report was filed 16 December 1973. Rustlers don't bother Ross Kananga's crocodile ranch. A sign a the gate warns: "Trespassers will be eaten." Kananga started his ranch four years ago on 350 acres of managrove swamp on Jamaica's north coast. He has a herd of 1,217 crocodiles. The place is called Swamp Safaris, and tourists can visit the ranch to see the swamp and pools where crocs live and breed. But Kananga's main business is exporting the valuable skins. "Crocodile skin now sells for $2 a pound and a whole good skin gets $450," Kananga told a visitor as they sat on the veranda of his rambling frame home encircled by crocodile pools. Tucked into his waistband was a revolver, insurance against Kananga becoming a crocodile lunch. Kananga comes from Florida where the crocodile is nearly extinct because of massive killing by skin hunters. The World Wildlife Fund reported recently from Switzerland that 15 of 21 crocodilian species all over the world "are already considered as seriously threatened." Crocodiles are still found in Jamaica, and Kanganga in his late 20's says controlled farming is the best way to have them. While he and his helpers annually kill some of the crocodiles for skin other crocs are being hatched at the ranch to replace them. Crocodiles are greener and have sharper noses than alligators, which are still found in the United States. Crocodiles are more dangerous and can reach 4,000 pounds and 15 feet in length, Kananga said. Above: Kananga assists as Roger Moore captures the sequence in which Bond is isolated on an isle of crocs. Kananga's crocodiles devour 6,000 pounds of assorted meat every week "Horse, cow, chicken, dog. It's all ground up, together." Each January, Kananga and his helpers go out into the swamp at night with flashlights and guns to harvest their crocs for the market. Recently hatched crocodiles are kept in smaller pens. Crocodiles lay their eggs on dry ground. Kananga plans to build 16 artificial islands in the swamp to provide more egg-laying ground. "When people come here, I show them how dangerous crocs can be and also how gentle," he says. "I can call one of them and he will come to the edge of the water and put his head on my knee." "Now, that croc there almost killed me one day," Kananga said, point to a pair of eyes peering from the middle of the main ground. "He's still after me." Kananga walked to the end of a board over the pond. The board is used to call the crocs at feeding time. "I don't even have to call this one," he said, as the crocodile slid below the surface and headed for the board. Kananga dangled an arm over the water. The pond boiled up under the board and 350 pounds of crocodile shot into the air, its jaws snapping at his hand. Kananga quickly pulled it away and got off the board. "One day I was cleaning out one of the puts and that croc came out of the water after me. Now, usually they stop after a few feet. But this one was unusually aggressive. "The pen was surrounded by an 8-foot chain-link fence. I grabbed for it, but the fence just came right down. Luckily another guy was nearby and he pulled me out. But the croc tore off my shirt. He was aiming for my kidneys." Kananga is a slim man with deeply tanned skin, longish hair and lengthy sideburns. His hands are scarred with crocodile bites. "But at least I still have all my fingers." His legs and face bear other scars. Above: Kananga and Moore relax between takes. Recently he began a profitable sideline to hi crocodile ranching. The movies. "Papillon," a film based on the book by Henri Charriere, was being filmed in Jamaica. "Part of 'Papillon' has been shot on my land," said Kananga. 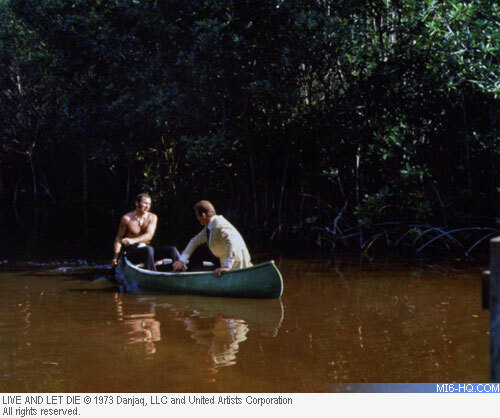 "There was a one scene where a guard shoots a crocodile and orders Steve McQueen and Dustin Hoffman to retrieve it. But when they get there, the croc is still alive. "We tied the croc down and bound its jaws. When the guard fired the black. When the guard fired the blank, I poked it with a stick hidden in the water to make it move around a bit. "Still, McQueen and Hoffman were pretty scared. When they got up to the crocodile, Steve said to Hoffman, 'You take the head.'" Kananga himself appears in the latest James Bond spy picture "Live and Let Die," also filmed in Jamaica. He doubles for star Roger Moore when Bond flees the bad guys by running across the backs of three crocodiles in a swamp. For that brief scene, Kananga received $60,000. He explains why: "Something like that is almost impossible to do. So, I had to do it six times before I got it right. I fell five times. The film company kept sending to London for more clothes. The crocs were chewing off everything when I hit the water, including shoes. I received 193 stitches on my leg and face." Still not all the danger is in the swamp. Kananga hobbled about the ranch recently with a broken ankle. Crocodiles? "No, a motorcycle accident."